Soundscapes from the post-anthropocene era. As we continue to study the accelerated impact human activities are having on the earth system, we imagined a world that can no longer nurture trees, one of adaptation, where new technologies have afforded alternative means of oxygen and the ability to extract personal histories from natural objects. Our solution was to create a speculative installation provoking thoughts on the value of tree's lived experiences throughout the earth's history and the implications of climate change. Stimulated by touch, LEDs gradually fill each ring and cue a distinct soundtrack representative of one of four life stages. Meant to encourage reflection and thought of legacy, connectedness through time, and human reliance and their participatory role in the natural world. These auditory experiences highlight the peaceful, natural environment, interactions with living beings, threatened experiences, and their eventual distinction. Epitaph was selected as part of the Murmurs From The Planet Earth juried exhibition at the SVA Chelsea Gallery. Epitaph is a memorial to the legacy of trees after their extinction. Salvaging personal histories after death. Following my grandmother's passing in 2015 I became interested in exploring individual's legacies. Realizing the irreplaceable value of personal histories lost to the living when a loved one passes, I began considering how might we collect this information prior to death and how might we might be able to collect this information after death. How might we build an object that provokes thought on the implications of lost histories? Considering the inability to extract certain qualitative information from the human body post-mortem, I began to consider other bodies in the natural world that contain stories. 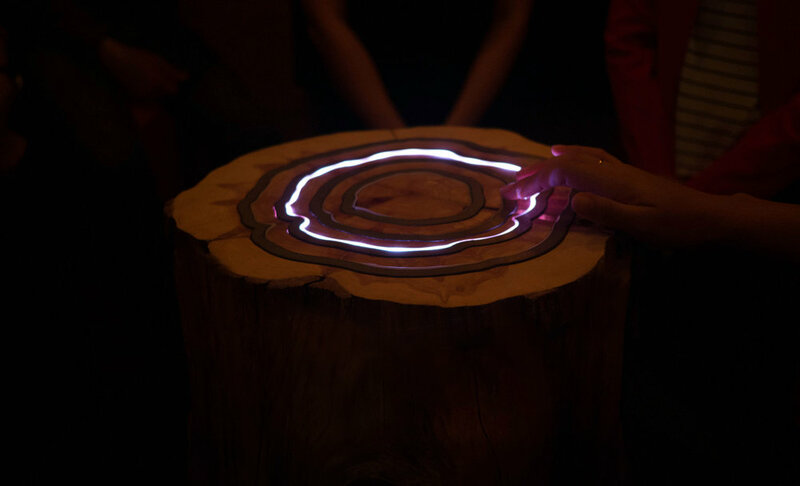 Just like anthropologists learn stories from excavated bones and geologists determine data from rocks, trees log information and share it using a naturally developed form of communication expressed in a series of irregular concentric rings in their flesh. This information can be used to determine a tree's age and serve as chronological records to analyze past environmental climates and conditions. But what if we developed a method of extracting other information, such as sound? Birth on earth: Primary physical sounds associated with trees coming to being and immediate physical environment. Life with Nature: Primary physical sounds in conjunction with their interactions with animals and the immediate physical environment. Life with Humans: Primary experienced sounds in conjunction with their interactions with indigenous peoples and progressing towards an industrialized society. Death: Sounds in conjunction with their interactions with humans in a heavily industrialized society and progressing towards their eventual demise. We explored possible directions for the experience, focusing on the physical space and design of the object that would be most intuitive for the end-user. After locking in on a direction, we needed to prototype, test the object with users, and iterate upon it to deliver a functioning and thought-provoking piece in just three weeks. The making began with running through simple prototypes to determine how to build our object. We also began testing with capacitive touch sensors, conductive materials, arduino, LED strips and code to determine if the ring input and feedback would function as desired. During the process, we came across FASTLED, an arduino library which made the prototyping easier than initially expected. Once we ensured that our sensors and feedback would work, we moved forward. In parallel, we consulted a sound artist in regards to designing the audio for each soundtrack and determining what tools we could use to cut into our wood. 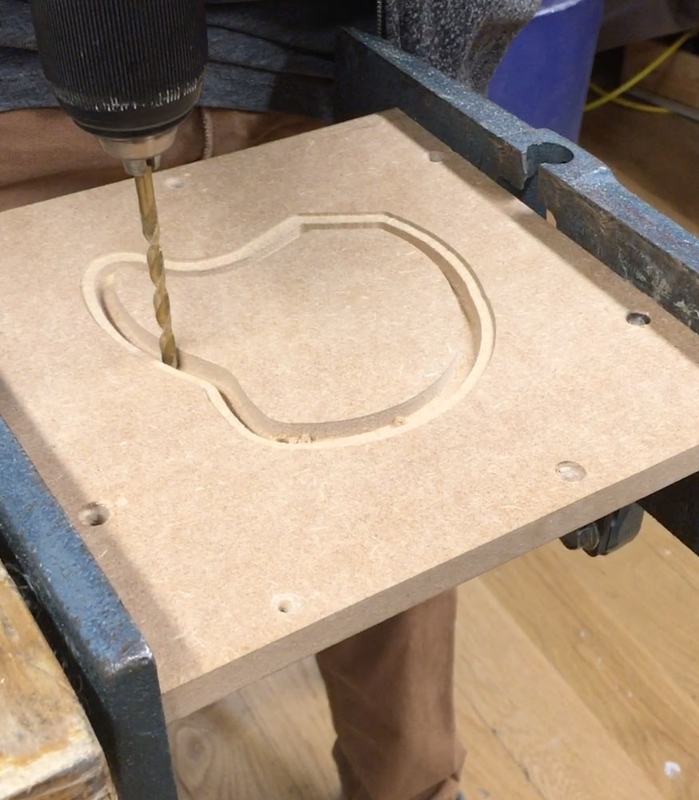 After consulting our campus fabrication lab we used the CNC router and scrap MDF board to create a single ring with two gutter depths, one that would hold the metal ring and a deeper gutter to house the LED strips. After tracking down an already fallen red cedar tree stump with well-defined rings from upstate, we began our final construction. Given the uneven cutting of the acquired tree slices, we brought them to a woodworking company who was able to plane the wood down to a smooth and even working surface. While the wood was being planed, we hunted for a place with metal cutting abilities that could create perfectly smooth metal rings that would fit perfectly into the gutter of the rings in our wood slice. We located a plasma cutter at the SVA sculpture gallery and after a bit of persistence they assisted us in cutting the metal sheets into the rings. Concurrently, we were drilling away and hand chiseling the stump to create a cavern that would allow us to house a raspberry pi and wires.